Plantronics Backbeat Pro 2 is superb in style and equally good in sound quality. It’s a great choice for a wireless headphone with active features. If you compare this with the original backbeat pro, then this is a much-improved version. There is a change in design and overall performance of the headphone is also good. The sturdy headphone comes with an amazing sound quality and easy to use control schemes. The audio reproduction and the bass of the headphone are awesome and that is where this headphone scores the most. The battery performance of Plantronics Backbeat Pro 2 is another added feature of the headphone. The headphone features active noise canceling that blocks the ambient sound. This feature is good but not completely great. But, with the price of the headphone, it will give you amazing sound quality. It does the job with the block feature and resonates the sound giving you perfect audio quality every time. Though the headphone is good in looks, it can be a tad bulky when you actually use the headphone. The overall audio quality of the headphone is immersive and that is again a good feature of this headphone. The sound performance of Plantronics Backbeat Pro 2 is amazing. Plantronics Backbeat Pro 2 is designed for all the people who love to travel. If you are also a travel person, then this can be a great buy for you as well. It features active noise cancellation. The feature helps to block the ambient sound giving you a clear audio quality. It also helps to block different frequency noises of the environment. It’s ideal for your music on the go. The audio quality of this headphone is amazing and that gives it an edge over other headphones that are available at a similar price. Is it perfect for gaming? Well, yes you can use this headphone for your gaming needs. The audio is clear in the range and sounds are good. It can indeed give you a great gaming experience. You can also buy Plantronics Backbeat Pro 2 for pure music experience. The bass is on the heavy side so it gives you an amazing response. If you like to hear your music at a stretch, then this one is surely for you. The headphone gives you 24 hours of streaming so you can enjoy your music and playlist for a very long time without actually charging your headphone. It’s a great pick for music lovers. There are many great features of Plantronics Backbeat Pro 2, let us look at some of the key features. Audio Quality of the headphone is immersive. The high-resolution sound and great speaker drivers deliver the accurate balance of rich bass, crisp highs and normal mid-tones for your music. Plantronics Backbeat Pro 2 features active noise canceling. You can switch on active noise canceling (ANC) to reduce ambient noise while working or traveling. You can also hear your music on the go with this feature as the audio is clear. Smart sensor feature in the headphone pauses your music involuntarily when you remove your headphones and then restart playback when you put them back on. This feature makes this headphone a tad different from other headphones that are available. The headphone offers 24-hour battery power. You can hear nonstop music for twenty-four hours without the need to charge your headphone. You can make calls and talk continuously with such a great battery. With three hours of full charge, you can play 24 hours of music. Plantronics Backbeat Pro 2 lets you stream audio to up to 100 meters /330 feet from Class 1 Bluetooth devices. There is no issue of connectivity in this headphone. In fact, being wireless also it offers a great connectivity. The headphone lets you make use of open-listening mode to hear your ambiance sounds with your headphones still on. You can connect two devices at the similar time and switch seamlessly between them. This is again a great feature of this headphone. It features Bluetooth v4.0 with Headset/Hands-Free Profile HSP 1.2 and HFP 1.6 (Wideband HD Voice); Class 1 BT Radio input. 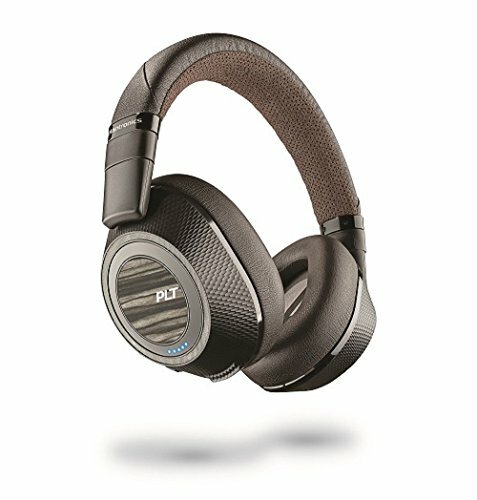 Plantronics Backbeat Pro 2 has audio profile advanced audio distribution profile (A2DP), AVRCP, AAC, which is again best in its class. The headphone has superior voice alerts that announce talk-time so that you can also be notified of it. It also supports many different languages. Plantronics Backbeat Pro 2 is wireless and completely light in weight. The headphone has a compact and stylish design. The headphone has 40 mm drivers with Plantronics signature audio and that makes it class apart. Plantronics Backbeat Pro 2 is good as compared to the previous models in the series. It features oval-shaped ear cups that fit better around your ears. There is no added clamping or no pressure on your ears with this. It’s not only well padded but also comfortable in fit. Even if you choose to wear the headphone for long hours, you will not really feel uncomfortable. Though the headphone is sturdy and heavy, it fits quite well. It perfectly fits irrespective of your head size. Even if the head size is big, it can be adjusted. The comfort is good for over ear headphone. The highlight of Plantronics Backbeat Pro 2 is its active noise cancellation feature. It completely blocks the sounds of the ambiance giving you a clear audio every time. It helps to minimize the ambient noise even while traveling or working in your office. The on-demand noise-canceling feature turns on with a button. If you do not require, you can completely switch it off. And, when you need that silence, switch it on. Though the frequency depends on the atmosphere, still it does a good job of canceling the noises around you. It also blocks the mid-range sounds and that is again great. The look and feel of Plantronics Backbeat Pro 2 headphone is stylish and the build is also sturdy. If you compare it with the previous models, then the headphone is indeed bulky. But, it’s not uncomfortable if you wear it for a longer time. The ear cups are designed in such a way that there is no clamping. The headphone is decently stable even when you use it outdoors. The headphone is made from metal and plastic frame and that makes a difference in flexibility too. You can use the headphone roughly, as the build is quite strong. Being a closed back ear headphone, this headphone has a good sound quality. The sound is not only consistent but also has a deep base. The midrange gives a real performance but it also depends on the frequency. The headphone has a well-balanced treble and that makes the sound clear. The low-frequency sound of the headphone is good. In the high-frequency range, the sound can be sharp. But, this actually depends on the type of music genre. Plantronics Backbeat Pro 2 has a below average soundstage and that is where it underperforms. Still, you can consider it for it’s a good sounding headphone. The battery performance of the headphone is awesome. In fact, it’s the highlight of the headphone for sure. You can get a backup of 24 hours without the need to charge. You heard that right. Two to three hours of charging can give you 24 hours of battery backup. You can listen to your long playlists or simply talk on the phone with this amazing battery life. There is no hiccup in the performance as its petty smooth. The charge function of the battery is good. It can easily be replaced according to your need. The battery of the headphone truly excels. It offers many control options. It would not be wrong to say that Plantronics BackBeat Pro 2 is a versatile headphone with some amazing features. It excels in almost all the departments. It is not only comfortable but also stylish over-ear headphone. The battery life of the headphone is great and that sets it apart from other headphones that are available in this range. 24 hours of battery backup is a boon for any music lover. There is no issue of connectivity either. Being a wireless headphone also, it excels in connectivity. The sound performance of the headphone is good and there is no issue in the low or mid-range frequency sounds as well. It is also good in fit and there is no clamping. It’s an ideal headphone if you want to listen to your music on the go because it features noise cancellation. It is also good for gaming and music. At this price, the headphone is certainly a must buy. The overall performance of the headphone is good.